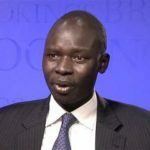 On November 2, 2016, the IGC co-hosted a private round table with the Brookings Africa Growth Initiative to discuss the current situation in South Sudan. The round table brought together a number of experts on South Sudan for a high-level discussion on the country’s current political and economic situation. The session’s objectives included promoting the exchange of information, generating ideas for collaboration, and building a more integrated network of South Sudan stakeholders in Washington DC. For further information on the event, please visit the official event’s webpage.